Just arrived home from the holiday/camp/race with plenty to catch up on but in the spirit of tranquillo let’s ease into things slowly. Romney joined me for the final week of my adventure. We casually sauntered across Spain, hiking, climbing, and wine tasting our way to Bruca and Alisa’s place in St Antonin Noble Val, France. One morning we woke up in the paradise that is Rodellar, Spain, and made our way north through fantastic scenery that also features some of the greatest venues for playing outside in the world. Since I haven’t gotten around to loading our pics yet I found a few videos to provide narrative for what was a most excellent day of climbing, hiking, touring and tapas. Rodellar is a small village at the end of the road situated on a plateau above a canyon filled with some of the best rock climbing I’ve ever done. This entertaining vid shows a few highlights. Viva la Vida Part 2 from Micky on Vimeo. 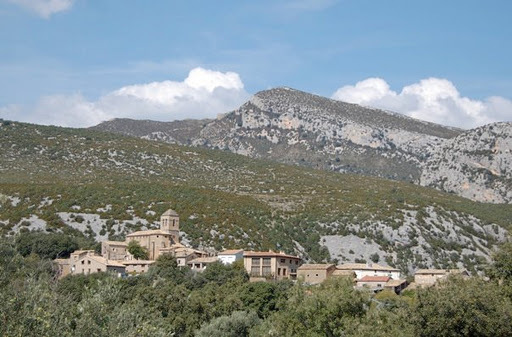 Rodellar is located in la Sierra de Guara, a Spanish national park that’s littered with a hundred lifetime’s worth of perfect rock. In Europe, mountain biking isn’t buffed out like it tends to be here in the states. Instead you explore ancient trails and roads built by Romans, Troglodytes, and/or dinosaurs. Of course each village you come across has a pub, meaning you don’t need to lug around a lot of stuff. Here’s a taste of what to expect. Las bellostas, Rodellar, Otin, Las Bellostas from alfons esterlich on Vimeo. We then headed east towards the crags of Lleida, adopted home of Chris Sharma and the settling of Rock & Ice magazine’s No Spain No Gain issue. For some reason almost all the rock in this region faces south, making it a winter area and keeping our modest forays to the shaded flanks. Sport Climbing in Catalunya, Spain (Tres Ponts, Terradets, Margalef) from Rock & Ice on Vimeo. The northern part of the region snakes through Collegats canyon. It’s an traditional area steeped in Spanish lore, and slightly off the modern climber’s radar, but the setting inspired me more than any other in Catalunya. Along with many long traditional routes there’s a stack of sport climbing that’s all muy bonita! Here’s a bike tour through the canyon. The river you can see looks like a kayaker’s dream and, sure enough, only 15k away the village of Sort is the most boating-crazed place I’ve ever been. It’s a ten minute drive to a region with more climbing the 95% of the world’s countries and I couldn’t find a mention of that fact anywhere. Just kayak (and some ski) stuff everywhere you look. There’s even a kayak art museum. Here are a couple of videos about Sort, home for our last evening in Spain. Sort 2010, wildwater world championships – day 6: sprint team winners, June 12th 2010, Sort (Spain) from WildWater TV Italia www.wwtv.it on Vimeo. Sort, Spain, Noguera Pallaresa river, promo-video W.W. Worlds 2010 from WildWater TV Italia www.wwtv.it on Vimeo. Hasta luego Espana. You will be missed.